This topic provides a brief overview of the Prism concepts with links to associated source code and documentation. **If you are considering upgrading from Prism 4.1 to Prism 5.0 we include a "What’s New" and "Upgrading from Prism 4.1" topic that you should read. Note: For .NET 4.0, Silverlight, or Windows Phone 7.x applications use Prism 4.1. Where to start depends on your goals and what you already know. Learn, Develop and Deploy Applications, and Upgrade from Prism 4.1 should help you understand if Prism makes sense in your application and how to get started. Learn: If you are new to Prism, this is a good place to start. You should also read through the remaining content in this topic. Learn about Prism Capabilities: Introduction. See how to consume the Prism Library in source code. 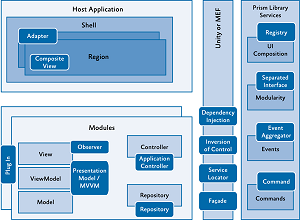 Develop and Deploy Applications: If you want to create a Prism Hello World application and deploy it then go through these topics. If you want to more fully understand how to utilize specific Prism capabilities in your application then read the content below. How to get your machine ready. Where to get library binaries. Create your first composite Prism application: Getting Started Using the Prism Library Hands-on Lab. Deploy Prism App: Publishing and Updating Applications Using the Prism Library Hands-on Lab. Upgrade from Prism 4.1: Read the topics below so you can perform a cost benefit analysis of upgrading to Prism 5.0. What's New in Prism 5.0. Learn how to create a composite application from loosely coupled WPF components that can evolve independently using the Prism library. Learn how to get a Prism for Window Presentation Foundation (WPF) application up and running – bootstrapping the application. 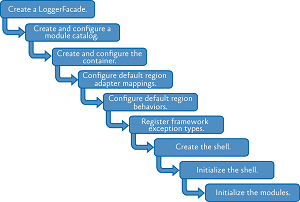 Create maintainable apps using dependency injection to manage components’ dependencies and lifetimes, facilitate testing, and wire views to view models. Learn how to create a loosely coupled modular application that is easier to develop, test, deploy, and extend. Learn how the MVVM pattern makes your app easier to test, maintain, and evolve. It improves code re-use and allows developers and designers to collaborate. Learn how to use composite commands, handle asynchronous interactions, implement user interaction patterns, and wire views to view models using MVVM. 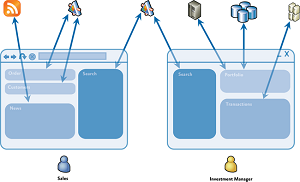 Learn how to compose your UI from loosely coupled WPF visual components for modular application. Create designer-friendly UIs with design time data. 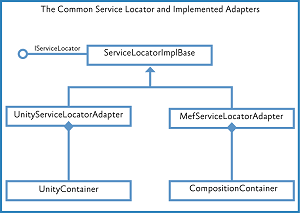 Learn how to navigate between views in composite WPF applications that use the MVVM pattern. 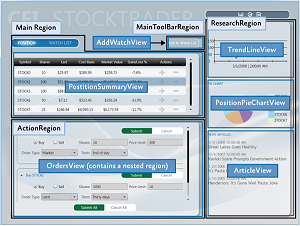 Use either state-based or view-based navigation. Decide when to use the different loosely coupled communication mechanism works for your modular application: commands, region context, shared services, and event aggregation. 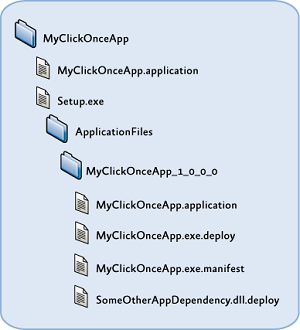 Learn the deployment options for a composite WPF application – Xcopy, ClickOnce, and Windows Installer. 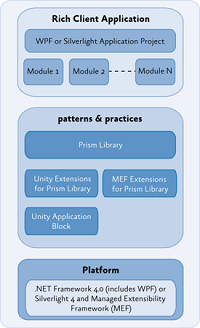 Learn the different patterns the Prism library and associated reference implementation demonstrate. Learn who the Prism library for WPF was developed for, how it is organized, how to modify the source, and how to run the associated tests. Learn how to upgrade your existing Prism 4.1 projects and solutions to Prism 5.0. This includes changes to references, namespaces, and APIs. 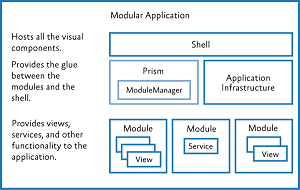 Learn how to modify Prism default behavior including bootstrapping, container, logging, modularity, regions, navigation, and view model locator. Prism Download: Download source or documentation, get links to the NuGet packages, or see the full content of this Prism release. Introduction: Read the next topic in the Prism documentation. On these community sites, you can post questions, provide feedback, or connect with other users for sharing ideas. Bill Wilder of Fidelity Investments, Brian Noyes of Solliance, Brian Lagunas of Infragistics, Clifford Tiltman of Morgan Stanley, Rob Eisenberg of Blue Spire, Norman Headlam, Ward Bell of IdeaBlade, Paul Jackson of CM Group Ltd., John Papa of Microsoft, Julian Dominguez of Clarius Consulting, Ted Neveln of Ballard Indexing Services, Glenn Block of Microsoft, Michael Kenyon of IHS, Inc., Terry Young of PEER Group, Jason Beres of Infragistics, Peter Lindes of The Church of Jesus Christ of Latter-day Saints, Mark Tucker of Neudesic, LLC, David Platt of Rolling Thunder Computing, Steve Gentile of Strategic Data Systems, Markus Egger of EPS Software Corp. and CODE Magazine, Ryan Cromwell of Strategic Data Systems, Todd Neal of McKesson Corp, Dipesh Patel of Fidelity Investments, and David Poll of Microsoft.